WXRY is working on our #SignalBooster campaign and is offering you a way to help us and get your music on WXRY in the process. For 24 hours on May 5th-Cinco de Mayo-WXRY will be participating in #MidlandsGives. Non-profits in the Midlands are competing for donations and special cash prizes for those that raise the most funds. It’s an all online, all credit card way to support the station as it expands its coverage area and is for 24 hours only! Anyone that gives to www.midlandsgives.org and searches for “WXRY” goes straight to our donation page on May 5th ONLY. While making a $25 or more pledge, that person can designate a name in the “in honor of” line—get your fans and friends to put YOUR BAND NAME in that line for a chance to have your song played on WXRY on Thursday, May 7th at 6:00 just after the top of the hour announcements. The band with the MOST mentions in that “in honor of” line WINS!! We’ll also throw in a night on WXRY Unsigned where your band will play 2 songs live and get another 2 played on air plus play a short set at the British Bulldog following WXRY Unsigned. Show date to be determined with WXRY Unsigned. 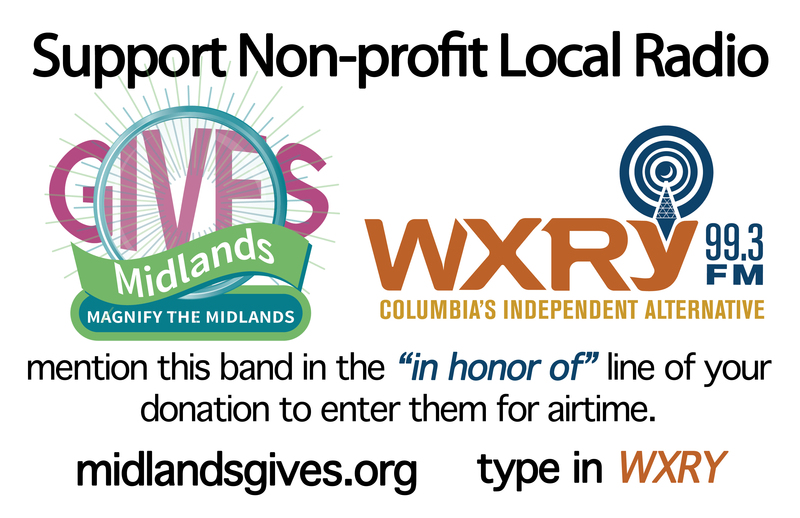 So let your people know you’re competing to get airtime on WXRY and that they can help by pledging to WXRY during #MidlandsGives on May 5th by putting your band name in the “in honor of” line on the form! Contest starts May 5th at midnight, ending at 11:59 pm. Follow @wxry (Twitter and Facebook) @wxry993 (Instagram) and www.wxryfm.org to keep up with all the details! Or email kris@indiepubradio.org for more information!! Posted on April 14, 2015, in News and Announcements and tagged indieradio, localmusic, midlandsgives, signalbooster. Bookmark the permalink. Leave a comment.